Teaching in a primary school is one of the most rewarding careers you can have. You will be working with a team of teachers and other adults to support children (aged 5 to 11) to succeed inside and outside the classroom. The course is taught by expert tutors with extensive experience working in educational settings, ensuring you are well supported to achieve the best results. 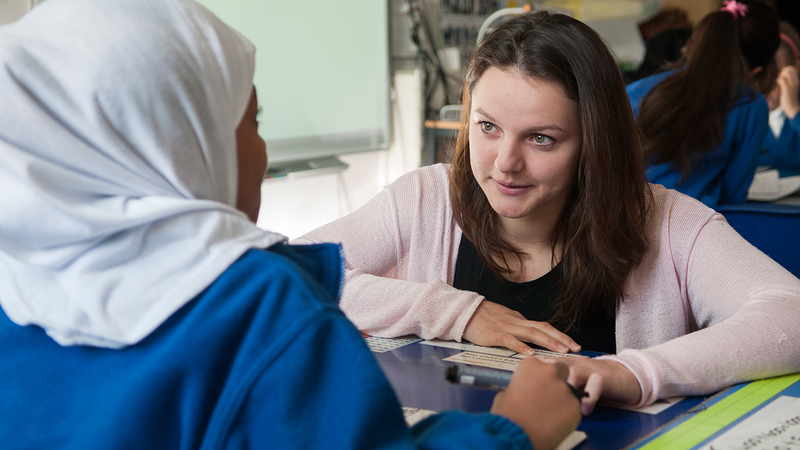 Why study PGCE Primary Education with QTS* at Middlesex University? This one-year full time course enables you to meet the national standards for the award of Qualified Teacher Status. We have excellent relationships with schools across London and the surrounding area and during your studies you'll spend up to 120 days in a school setting. You will gain a thorough understanding of the education system and practical teaching strategies as well as then having the opportunity to apply them. You will be introduced to further issues and strategies each week, which you will be able to investigate and apply in a practical setting before reflecting on the entire experience. The serial nature of the course allows you to return to University regularly to reflect on your practical application. The teaching quality and individual support for students on the Initial Teacher Training (ITT) programmes at Middlesex consistently produce the highest outcomes and very high employment rates of our trainees who typically gain their first teaching appointments during the courses. You will benefit from the guidance of expert tutors who bring a wealth of professional experience to their teaching, and who are widely published across disciplines such as multilingualism, diversity and childhood development. rated the teacher training as ‘good’ for our Early Years, Primary and Secondary courses. What will you study on the PGCE Primary Education with QTS? This is an intensive five-day-a-week course, during which you may also have directed work to carry out during the Christmas and Easter holiday periods. You should expect a teacher's normal working day during your school placement. The school-based component is focused on two placements in different schools which will provide you with opportunities to teach across the 5-11 age range in Key Stages 1 and 2. Initially, you will assist the class teachers before taking responsibility for the classes for a substantial period in the spring and summer terms. You will be placed in our partnership schools where teachers have been trained to act as mentors to support and assess you.. You will also have the opportunity to do a third placement in a SEN/D school. You should expect to spend a total of 120 days in school over the two placements. During the University-based component of the course you study the subjects of the National Curriculum for the primary age range, with their appropriate pedagogy. You are introduced to the practical aspects of classroom management and explore some wider issues concerning early years and primary education. The course content will reflect current initiatives and developments in education. If you have an A Level in Maths at Grade B (or equivalent) you could be eligible to receive the £6000 bursary for primary with maths. With this option, we can offer additional training in maths whilst preparing you to teach the full primary curriculum so that you develop a maths specialism. Eligible applicants should still apply for the PGCE Primary Education (QTS), and highlight their eligibility in their personal statement. Our most recent OFSTED report (Dec, 2016) highlighted that maths is a strength across our primary provision, and that trainees and NQTs develop a secure understanding of complex areas of the mathematics curriculum. This module will enable you to develop your knowledge and understanding of how children learn and progression in learning, and will develop the pedagogic knowledge, understanding and skills needed to teach Key Stages One and Two of the primary school. Through this module, you will develop your knowledge and understanding of English, Mathematics, Science, Computing, Religious Education (RE), Physical Education (PE) and Modern Foreign Languages within the primary school curriculum. The focus for the written assignment for this module is the role of talk in learning and teaching. The purpose of this module is to prepare you for School Based Training 1 and to provide the basis for planning and teaching during your first placement. During School Based Training 1 you are placed in a partnership school in either Key Stage 1 or Key Stage 2. Initially, you will observe good practice and work alongside class teachers, and as the placement progresses you are supported to take on increasing responsibility for whole class teaching. To develop well-informed thinking on teacher identity and empowering pedagogies, and to understand how making meaningful connections and interrelationships across the curriculum can enrich and enhance learning and teaching within and across all subjects. To critically engage with inclusive practice, utilising a range of teaching and learning approaches, activities and resources that engage all children actively in learning both within and outside the classroom. To critically reflect on cultural responsivity and the power of learning beyond the classroom, and to understand that all children must have access to a range of cultural and environmental experiences as an part of their learning and personal development. Consider how all these aspects contribute to being an effective, influential teacher and learner. The purpose of this module is to enable you to prepare for School Based Training 2 and to provide the basis for planning and teaching during your final placement. During School Based Training 2 you are placed in a partnership school in a contrasting setting and in a different Key Stage you experienced in School Based Training 1. During School Based Training 2 you will be expected to take on substantial responsibility for whole class teaching. Optional modules are not offered on every course. If we have insufficient numbers of students interested in an optional module, or there are staffing changes which affect the teaching, it may not be offered. If an optional module will not run, we will advise you after the module selection period when numbers are confirmed, or at the earliest time that the programme team make the decision not to run the module, and help you choose an alternative module. How is the PGCE Primary Education with QTS assessed? All University-based modules are assessed by coursework. School-based modules are assessed against the standards for Qualified Teacher Status (QTS). Each module is assessed on a pass/fail basis. All modules are compulsory and must be passed. You do not have an automatic right to reassessment for the school-based modules. Degrees in all subjects are considered. It is recommended that you gain some experience of working in a school context before you start the programme. Recent experience in a primary school setting will support you in making the right career choice and, if completed prior to interview, will support you in your ability to contribute to the tasks during the selection process. Entry onto this course requires an interview. We use the interview to find out more about you, to better understand your aspirations and interests, and to explore why you want to study with us. All applicants for PGCE Primary Education programmes will be required to pass the Department for Education Professional Skills Tests in Numeracy and Literacy. 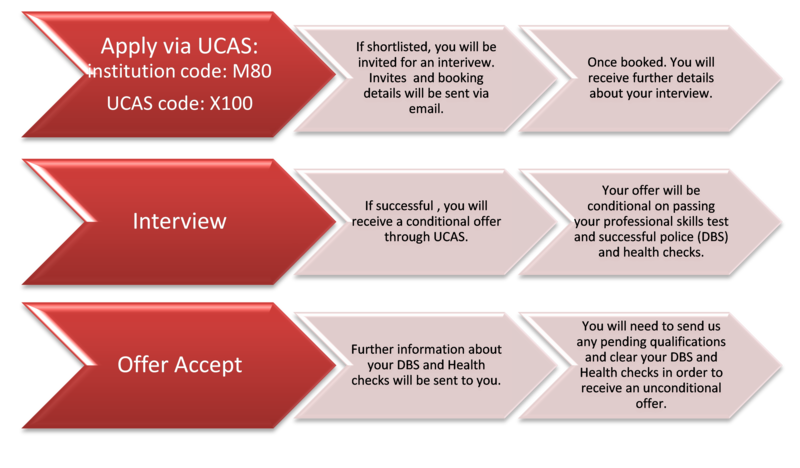 You should submit an application as early as possible via UCAS and if invited for interview, then make arrangements to book and take the skills tests as soon as possible. We strongly advise that you book and pass the test before the interview as that will give you the best possible chance of success. However, if you haven't passed at the time of the interview, your offer will be conditional on passing the tests by an assigned date. For more information on how to prepare or book a professional skills test, please visit our advice page. Additionally you must have GCSE grade C / grade 4 or above in English and Maths or be retaking them this year. We also accept the equivalency tests by Equivalency Testing, A Star Teachers or any other appropriately accredited provider. We cannot accept functional skills or key skills or IELTS. You must have competence in English language to study with us. We normally require GCSE (or equivalent) grade C in mathematics, English and science. We accept equivalency tests by Equivalency Testing, A Star Teachers or any other appropriately accredited provider. We cannot accept functional skills or key skills. IETLS not accepted. The fees below refer to the academic year 2019/20 unless otherwise stated. Successful completion of this course leads to Qualified Teacher Status, allowing you to work in any state school in England. This means the course is professionally recognised for being of the highest quality, focused on developing the knowledge and skills that schools require. How can the PGCE Primary Education with QTS support your career? Middlesex University has consistently high employment rates for its teaching programmes. We have excellent relationships with schools in north London, Essex and Hertfordshire and many of our graduates start their first teaching post at the school where they completed a placement during the programme. Our course gives you Qualified Teacher Status (QTS). Teaching is a profession with excellent progression and benefits and our graduates have an excellent reputation within the profession. Our employment rates are extremely high with 98% of our PGCE graduates in employment or further study six months after graduation, earning an average starting salary of £26,000. Qualified Teachers starting salary in London is £29,664.